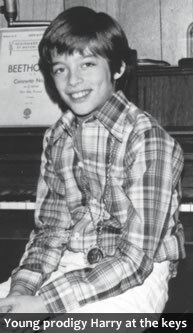 Sept / Oct 2014 Harry Connick Jr.
Born September 11, 1967, Connick seemed destined for musical success from an early age. He began performing as a pianist and vocalist in his native New Orleans at age 5 — yes, 5 — and recorded his rst record, Dixieland Plus, at age 9. Along the way, he soaked up the tutelage he received from legendary keyboardists James Booker and Ellis Marsalis. 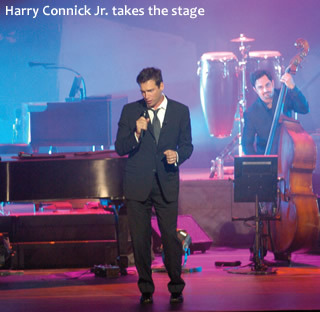 At 18, Connick left the Big Easy for the Big Apple, descending on New York with a prodigious set of skills in jazz and popular music. Things have worked out fairly well since then: Connick has recorded some 30 albums that have sold 28 million copies worldwide. He has also composed music for television, the Broadway stage and additional Hollywood blockbusters. 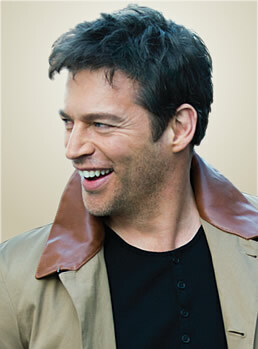 While known primarily for his musical acumen, Connick has displayed serious prowess as an actor. His lm career began in the 1990 movie Memphis Belle. He later portrayed a serial killer (yikes!) in Copycat (1995), a fighter pilot in Independence Day (1996), and a leading man opposite Sandra Bullock in Hope Floats (1998) and Renee Zellweger in New in Town (2009). In 2011, he played Dr. Clay Haskett in the inspiring, family- friendly hit film Dolphin Tale, a role he is reprising in this year’s sequel, Dolphin Tale 2. On the home front, Connick has been married to actress and former model Jill Goodacre for more than 20 years, and they have three lovely daughters: Georgia, 18, Sarah, 16, and Charlotte, 12. 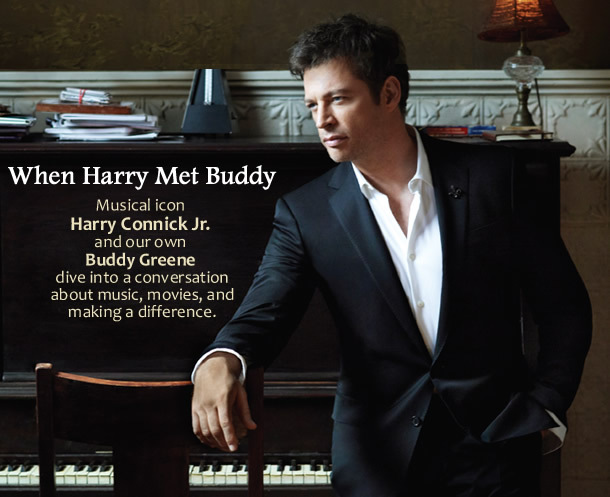 In a spirited conversation with our very own Buddy Greene, Connick opens up about his musical roots as a child in the Crescent City, the family pets, his role in Dolphin Tale 2, the Catholic faith that has helped to shape his heart for volunteerism, the prospects for a Harry Connick gospel album (we hope so! ), and much more. 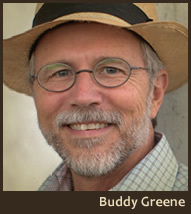 BUDDY GREENE: Good morning, Harry! HARRY CONNICK JR.: How you doing, man? Taylor. He played accordion on the album you did last year, here in Nashville. HARRY: Man, that guy’s a genius. BUDDY: He said the same thing about you. He said it was just a great experience working with you in the studio. He goes on the road with me a good bit, and we have a great time — love that guy. BUDDY: Well, I’m a huge fan, Harry. Your career has been a great one and fascinating to me ever since … I think maybe the movie When Harry Met Sally was the first time I heard you. HARRY: Wow, that’s going back a few years! BUDDY: Yeah, well I go back a few years. (laughs) In doing research for this interview, I went crazy over that big band special you did in 1992 in New York City. What a fabulous concert! BUDDY: First of all, I want to ask you what it’s like to be in front of all that power? HARRY: It’s great. The thing is, as the arranger, the power is based on … I mean, the musicians are all very powerful players, but the power comes from a combination of their playing ability and the arrangement. When I was younger, I didn’t really understand how to tap that power, so they were playing loud and hard, but the real power didn’t come until later, when I had a couple hundred of those charts under my belt and had learned how to write for them. When you get it right, it’s pretty amazing. There’s a lot of stuff going on, and you can create some pretty powerful environments if you do it right. BUDDY: Yeah, the arrangements are fabulous, and what a dynamic ride you’re able to take on those. Do you still get to do the big band thing a lot now that you’re doing so many other things? the road maybe five months ago, touring with the big band. I don’t tour 12 months a year … I take a break to do the other things. BUDDY: Right. Well, I’ve gotta watch myself. I could talk music all day long, but I have a lot of things I want to talk to you about! At the top of the list is the new Dolphin Tale movie. You’ve been in two of these, man, so I just want to ask what attracted you to this story and playing the role in these movies? HARRY: Probably first would be Charles Martin Smith, who wrote it and directed it. He’s a really bright guy, and I just liked his whole take on it. He has a way of really listening to the actors and creating a world for us that’s very comfortable and stimulating to be in. And of course, I liked the story and the messages that the film had. Then, when the second one came around, it was exactly the same team and also based on a true story. Charles wrote and directed it, and it just seemed like another opportunity to do something really heartfelt and fun. BUDDY: Yeah, it is a great message in these movies. Is that something that has resonated with you for a long time? 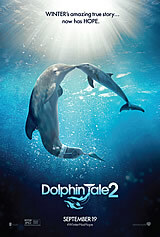 I think about dolphins, especially a dolphin like in this movie, as sort of collateral damage from our fishing techniques out there. Has that sort of thing concerned you? HARRY: I’ll be honest — I hadn’t really thought about it a lot before I did the movie. But afterward, I got deeply involved in what the story was about. It just gives you a different perspective on what human beings who have had their share of difficulties go through. When you see this animal sort of just accepting what happens, it’s just an amazing thing to watch. It’s inspirational. And when you look at people with disabilities, you see — I mean, we saw it every day when we were down there — it’s an amazing thing to behold, the connection that people with disabilities have with this incredible creature. I became more aware of the whole thing when I did the movie — I learned a lot. BUDDY: Any great stories from the set that stand out to you? HARRY: Oh, man, every day on the set with all of those animals was incredible. You know, all the animals there have some sort of disability. I think a lot of people confuse the Clearwater Marine Aquarium with Sea-World or places like that. It’s not like that at all — this is a place that rehabilitates animals. Their whole mission is to rescue them, rehab them and release them. The whole point is to get them where they can survive on their own in the wild, and if they can’t, they take care of them for the rest of their lives and try to give them the best quality of life that they can. So, to be around not only the animals, but also the volunteers … they were volunteers in every sense of the word. They work so hard for nothing, just because they love what they do. To be around all that every day is an exceptional environment. BUDDY: Did you work with or meet Bethany Hamilton (Soul Surfer)? I understand that she is in Dolphin Tale 2. HARRY: Yeah, I didn’t get to work with her, because we were shooting on different days, but I had a chance to meet her and spend some time with her. You talk about somebody who is an inspiration. I mean, she’s incredible — the fact that she just walks around and doesn’t try to hide that she’s missing her arm — she’s amazing. She is the type of person that you meet and think I hope I would have that sort of outlook if anything happened to me. She’s incredible, absolutely incredible. BUDDY: Well, Harry, this issue of Homecoming Magazine is themed around pets and animals, so let me ask you — are you a man who has always had pets in your life? I know you are a family man — do you all have any pets at home? HARRY: Yeah, we have two dogs and a cat. We love animals, and I think it adds a whole other dynamic to your family when you have animals running around. I think it’s great for kids, if you have the means to take care of them and spend the time and effort with them. There’s nothing cuter than bringing home a little puppy or kitten, but you have to think that for the next 10 or 15 years, you’re going to have to take care of this animal. We’re happy to be able to do that, and it’s great. Our kids love them, and I love them — it’s really fun. BUDDY: How about from childhood — any favorite pets? HARRY: I saw a dog under our car — I guess she was lost or a stray or something. I thought it would be cool to name her Under Carla, because we found her under the car. So that’s what we did! BUDDY: (Laughs) I don’t think I’ve ever heard that moniker! HARRY: Yeah, it’s pretty silly. BUDDY: Speaking of your childhood, I know you’ve been called a child prodigy. How old were you when you recorded your first album? HARRY: I was 9 when I did my first one. BUDDY: Wow. And what kind of music was it — were you playing jazz standards? firmary” and all those traditional jazz tunes. BUDDY: And that was stuff you cut your teeth on, down there in New Orleans? HARRY: Yeah, that’s really the first stuffthat I heard, because we had such immediate access to the French Quarter, where all that music was being played. We frequented a lot of those clubs on the weekends, and my parents would take me and my sister down there all the time. So that was the first music I really heard in my life. BUDDY: Well, it’s great to see how you developed as a musician; you had some incredible teachers in your life — people like Ellis Marsalis and other great mentors. 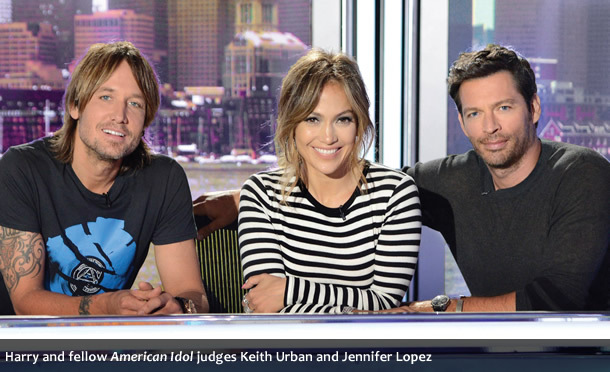 at’s been a huge, important part of your training and development, I would think, and it really shows when you are on something like American Idol, as a judge but more importantly, as a mentor to some of those singers on that show. HARRY: Well, the tough part about being a judge is that you really can’t mentor. You don’t have the time; you’ve only got 30 seconds or whatever to critique and maybe give a little bit of advice, but it’s very different from being a mentor. I mean, I grew up around both; I had mentors, and I also had judges. When I would compete, the judges wouldn’t say a whole lot; they would kind of give you a thumbs up or a thumbs down and send you on your way. But the mentoring happened with all kinds of people as I was growing up, and that’s where you really learn. at’s the hardest part about being a judge. You know, I don’t even get a chance to meet these young performers. I don’t meet them until after they’re eliminated from the show. I see them walking around the halls and stuff, but I can’t talk to them. BUDDY: But you did a little bit of coaching on the show as well, right? HARRY: I’ve done that in years past — for a couple of seasons, I was a mentor. BUDDY: That’s what I loved — I loved what you would stress to them. Learn the melody; especially if it’s a classic song with a strong melody, learn that thing rst. And do you know what you’re singing about; do you understand these lyrics so that you can deliver them with an honest emotion? I thought that was so important to pass along to these young artists who have great chops and technique and everything, but maybe haven’t thought through the whole creative process very well. HARRY: Yeah, I mean, it’s like moving to a new city and if you’re going from your house to work, you take the main roads. You have to learn those main roads before you can start veering oand taking back roads and shortcuts. A lot of these young men and women are taking all these shortcuts, but they don’t know what direction it’s going — they don’t know anything. And that’s part of being a young performer — I went through that; we all go through that. But it’s a culture, now, where it’s not important — learning the melody, learning the lyrics, understanding what the lyrics mean, understanding what you have to do to create a relationship between you and the audience. And all of those things — that’s never going to stop. Those elements of performing are never going to go away, and you have to have an understanding of them so that you can develop and improve. You don’t have to, but, you know, you can also have a two-year career and then wonder what happened. HARRY: I mean, if you want to be an artist of substance, these are things that you have to know — there are no shortcuts around them. So I try my best to give them as much of that as I can. BUDDY: Yeah, I know exactly what you mean, because when I moved to Nashville 30 years ago, it was to play in the band of a country music entertainer, Jerry Reed. Do you remember him? BUDDY: And coming up from Georgia, you know, I was excited to be playing with one of my heroes and all, but I just came up with all of my licks and all of my stuff, thinking that I had made it. But man, all that happened was that I’d finally gotten the chance to get the apprenticeship that I’d always needed. And Jerry, you know, would get all over us about how we made a piece of music feel, and whether we were rushing it, or just playing a bunch of notes without really thinking about what we were playing. It was the best thing that ever happened to me. HARRY: Yeah, I remember being 18, sitting in Lionel Hampton’s apartment, playing a tune for him, and he looked at me and said, “Man, you’re playing all those high-dollar chords. Don’t play that.” Now, this is a guy who knew every high-dollar chord in the book. He schooled me. Just like you got schooled by Jerry. I got schooled by countless musicians. The musicians I respect the most are the ones that have all the knowledge but also have all the passion and the maturity. There have been so many great musicians who don’t know anything about music; and there are plenty of musicians who have all the technique in the world, but who aren’t especially soulful. Then you have the real ones who have both, and those are the ones that I like the most. HARRY: Yeah, I’d been working with Habitat for a while, and then when Katrina happened, it was pretty easy to join up with them. They had a big chunk of land in the Ninth Ward, and I thought, along with Branford Marsalis, that it would be a good idea to try to build some homes to get some people back. You know, Habitat’s whole thing is sweat equity, so when people buy a home from them, they also have to buy it through labor. So we put the word out to musicians to try to come back. 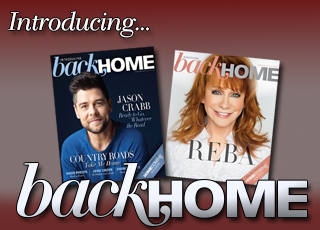 We ended up building 80 homes, and about 80 percent of those are musicians and their families. Then, ultimately we built the Ellis Marsalis Center for Music, which is an 18,000 square foot, state-of-the-art learning facility for music. HARRY: Yeah, it’ll be something I’ll be involved with the rest of my life, and look forward to it. It’s pretty cool. BUDDY: I know you’re a man of faith, a lifelong Catholic — how does your faith inform those kinds of good works for the community and things like that? HARRY: I mean, it’s definitely the foundation for it. But like they say, God works in mysterious ways. What I do isn’t based on that. I think faith provides the opportunity for me to be able to think about that stuff, but… Basically, I took this lead from my parents. My parents were public servants. My mother was a judge, and Dad was a district attorney. They spent their lives serving other people and trying to make the community better. My sister is a Major in the Army— that’s what she does. So, you take cues from that. I take my lead from them and do what I can to try to be the best person I can and maybe help people along the way. BUDDY: Absolutely. And, you know, one other thing … as I was looking around You Tube, I ran across a little clip of you — it looked like somebody had done it with their iPhone or something — but you were in a church somewhere. It was a Methodist Episcopal church, and you were at the keyboard and had a band around you, and you were doing “The Old Rugged Cross.” Man, it was beautiful. HARRY: Well, thanks. If I remember correctly, my friend Jonathan Dubose is a minister at a church in Connecticut. I think that’s what that was. BUDDY: It was great. It’s the first time I’d heard you play a gospel song. Do you think you’d ever want to do a project of gospel music some day? HARRY: I think so, at some point. I have so many things just buzzing around in my head. When you go into the studio, you have to be very definitive about what you want to do. And then when you put a record out, you have to do press around it and promote it, and you have to go on tour with it, so … you know, I’d love to go in the studio and make a gospel record, but if I wanted it to be successful, it would take a lot more than that. So, I’ll just have to find the time in my life when I can dedicate enough effort to it. BUDDY: Well, I know you’re a dedicated family man — you’ve got three beautiful daughters. I have two daughters who are grown now, and I’ve got a lot of women in my life, so I really felt for you, as I looked at that family you’re a part of! But I also wanted to ask you … growin’ kids up and being a part of family and doing what you do, especially … it could be quite a juggling act sometimes. Do you find it hard to balance all those responsibilities and get your priorities right? HARRY: Not really. I’ve been with my manager since I was 18, and she understands what my priorities are. ere’s a time for work, and there’s a time for hanging out, and we’ve had a pretty good system going for 30 years. I mean, my family understands that sometimes I travel, but most families have at least one parent that works. You can’t be with your kids all the time. So, this system that we have works well. I get to do everything that I like to do, and I spend a lot of time with my family. BUDDY: I know sometimes it can be a challenge for kids when they have a high-profile parent, especially one who’s a celebrity. How do you go about encouraging your kids in this world and keeping their feet on the ground? HARRY: Well, there are lots of ways, but I think primarily, I spend a ton of time with my kids. All three of them and I have different relationships. It’s just about taking it a day at a time and trying to let them have a fruitful discovery process and figure things out and be there for them when they need you. Love them, and try to teach them what you think is right, and hopefully when they’re old enough to live on their own, they will have picked up a few things along the way, you know? BUDDY: Well, listen, you’re a fabulous interview, and seeing you on some shows like Letterman and Leno, it just cracked me up. Whatever wave is in front of you, dude, you know how to jump on that thing and ride it! There were some hilarious clips of you with Conan O’Brien and others that really tickled me. You come on those shows really loaded and ready to go with whatever is in front of you. HARRY: You’ve got to, man. You know how it is … if Jerry Reed throws a new tune at you, you’ve gotta be ready to play it! It’s the same principle — it’s all the same stuff. BUDDY: (Laughs) That’s right. Well, you have great spontaneity in those situations. But yeah, it does — it shows the instincts of a tried-and-true musician who’s ready for anything to happen. BUDDY: Well, listen, Harry, this has been great. Thanks for talking with us today. HARRY: All right, bro. Thank you!